Chris and Sonja - The Sweet Seattle Life: Disneyland! I came across this picture in an obscure folder the other day and just about died laughing. This was from Disneyland a couple months ago with Megan and Alex. It's the buzz lightyear ride and the goal of the ride is to "shoot" these little targets throughout the area. 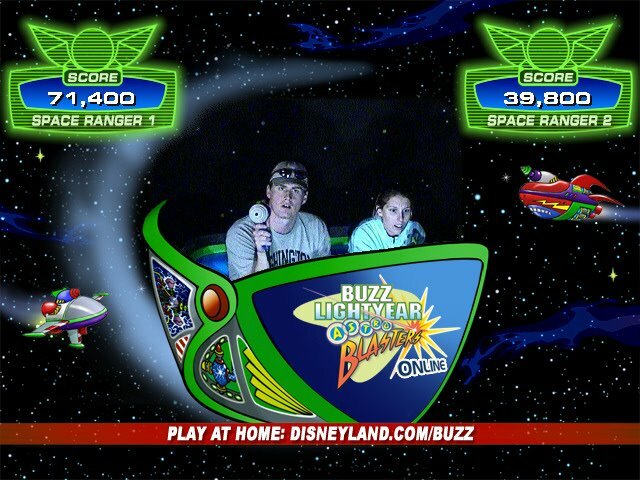 I didn't figure out until about half way through the ride that you actually got points for shooting the target. I was shooting at Chris for most of the time just because it made such a funny noise. As you can see, he has almost double my score. We look very intent, don't we? This picture is so funny! I was just talking to someone about this ride too. She was saying how her and her husband just expected a cute little ride and actually had a great time! We loved this ride. It was the last one we did after a very long day Disneyland. I would recommend it... and the newly renovated space mountain ride.